Scrub hickory has the most restricted distribution of any Carya species in the United States, being confined to about 20 counties in central Florida centered around Osceola County (Little, 1977)(distribution map). 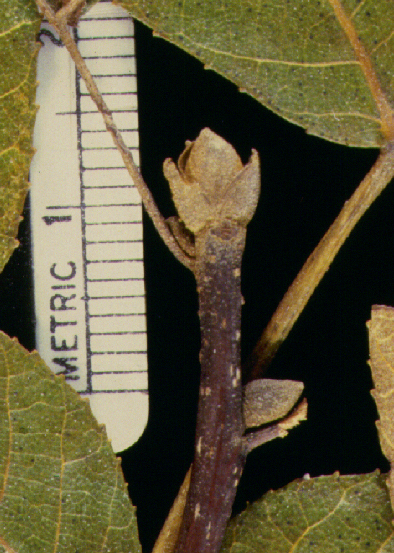 C. floridana is identified by the abundant, rust-colored scales on the buds and lower leaf surfaces which separate the species from all others except C. texana. 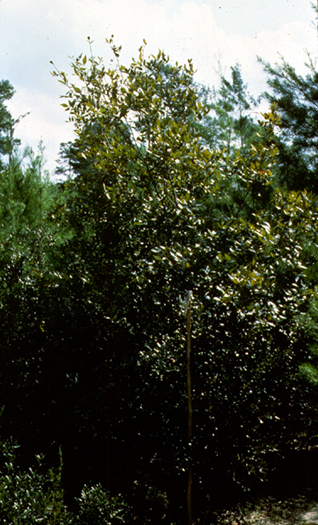 Herbarium specimens of scrub hickory can be separated from those of black hickory only by information on the origin of the samples, the two species being entirely allopatric. It is interesting that these two species show close similarity grouping based on data from chromatographic analysis of nut oils (Stone et al., 1969). Scrub hickory varies in habit from a multi-trunked shrub, bearing fruit on stems 3 to 4 feet in height, to a single trunked tree of 50 to 70 feet in height (Sargent 1922). Its nuts were found by Abrahamson and Abrahamson (1989) to be the most energy and nutritionally rich of the nine animal dispersed fruits of the Florida sandridge habitat which those authors examined. However, use by wildlife is limited to rodents, black bear, foxes, raccoons, and specialist insect seed predators which can cut the thick, hard shells.